The Station for today is in the church of St. Vitalis, martyr, the father of the two illustrious Milanese martyrs, Sts. Gervasius and Protasius. It was built about 400, and consecrated by Pope Innocent I in 401/2. The dedication to St. Vitalis and his family was given in 412. The church has been rebuilt several times, of which the most comprehensive rebuilding was that of Pope Sixtus IV before the 1475 Jubilee. It was then granted to Clerics Regular. The Church, as though she feared that the very splendor of her liturgy might lead simple folk into thinking that Christianity consisted merely in holding functions and receiving the sacraments, insists continually in her Lenten formulas that we should by our good works, give reality to what is so sublimely expressed in the liturgy. Saint Vitalis is the titular saint of the famous Basilica of San Vitale in Ravenna. Little can be confirmed about him beyond the fact that he was an early martyr, probably at or near Milan. According to one account, Vitalis was a soldier who encouraged the physician St. Ursicinus of Ravenna to stand firm in the face of death for the sake of Christ. Accordingly, the governor ordered Vitalis to be racked and then burned alive, which was done. St. Valori, his wife, was set upon by pagans near Milan and died from their brutal treatment. These events are said to have transpired under the persecution of Nero, though the second-century persecution under Marcus Aurelius (161-180) is a more likely date for their martyrdom. A disputed letter by St. Ambrose states that the twin martyrs Sts. Gervase and Protase were the sons of St. Vitalis, and when the brother-martyrs’ cult came to Rome in the fourth century, a richly-adorned oratory was erected to them. When the oratory was turned into a basilica, Pope St. Gregory the Great re-named it after their father, St. Vitalis. It is one of the original twenty-five parishes of Rome. In 1475 San Vitale had to be rebuilt completely, and Sixtus IV (1471-1484) reduced it to a single nave. The Jesuits were entrusted with the basilica from 1598 until 1880. In 1859 Blessed Pius IX completely renewed the roof, pavement, and other parts. 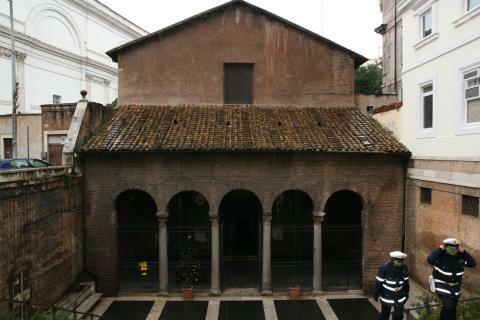 Of the fifth-century church, only the portico and its four columns, the façade, and the apse belong to the original structure. The carved wooden door shows us some fine 17th-century craftsmanship; inside, the painted columns along the walls remind us of the previous size of San Vitale. Note an amusing anachronism: though St. Ignatius of Antioch is said to have been martyred by wild lions in the Colosseum, the wall painting of his martyrdom shows him facing lions in a meadow with the Colosseum already in ruins in the background. Relics include those of Santi Feliciano, Illuminato, Vittore, Teodoro, and Bonasa, martyrs. St. John Cardinal Fisher, martyred by Henry VIII, was the titular of San Vitale in 1535.